CHALLENGE: As MEDITECH continued to grow, it needed a facility that would not only accommodate new and future employees, but also provide and opportunity for existing employees to relocate closer to home. The four-story, 122,000-sq.-ft. building, located in Fall River, Mass., includes hundreds of workstations, dozens of private offices, 28 conference rooms and eight training rooms. Situated in the southeastern part of Massachusetts with a panoramic glass façade that capitalizes on water views, the Medical Information Technology Inc. (MEDITECH) Building, also called “Meditech Southcoast,” is a tribute to the community and a major component of the area’s economic revival. CRITERIA: Thermal performance was paramount to the project. To address Massachusetts’ strict energy code requirements, specifications called for low U-values and enhanced thermal performance. A design choice needed to be made: Either a new custom system would need to be created specifically for the project, or the designs could incorporate a strategic combination of existing products integrated into an advanced façade. Supporting the curtain wall posed a structural challenge. All four stories of curtain wall required suspension from the roof framing to accommodate a central atrium space. The building’s flyby bays (5-ft. wide x 15-ft. tall) cantilevered horizontally beyond the outside wall, making the wall look larger than the building behind it. Special anchoring was needed to address the design. 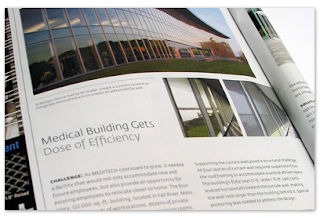 INFLUENCES: Besides helping advance the economy of the Fall River area, MEDITECH wanted to create a building that would advance the way sustainable structures are created. To carry out the design, Boston-based Payette was selected as the project’s architect; the company worked to incorporate sustainable elements into the building that would capitalize on the natural landscape and scenic location of the site. To provide advanced energy performance and meet Massachusetts’ stringent thermal requirements, MEDITECH Southcoast features an advanced façade, a synergistic, seamless integration of products designed to provide advanced energy performance and indoor environmental quality. Using a collaborative approach, the advanced façade includes high-performance glass, thermal doors and windows, and motorized sunscreen systems that automatically respond to exterior solar conditions and are integrated into the versatile curtain wall. SOLUTION: An advanced façade was created using a collaborative approach to achieve optimum results. Kawneer’s capability to combine internal expertise and a vast product line, coupled with the customer’s regional fabrication/installation skills, helped optimize the fenestration solution to meet architect/owner specifications for a high-performance building. Kawneer’s 1600 Wall System 1 curtain wall, outfitted with automatic solar-tracking motorized shades to provide maximized daylight and views while offering sunshading, was used in the creation of the advanced façade, helping contribute to the overall indoor environmental quality of the building. Additional combinations of high-performance Kawneer thermal products – 7500 Wall curtain wall, 1600 Wall System 1 curtain wall, 560 Insulclad Thermal Entrances, 8225TL ISOLOCK Windows and 2000T Terrace Doors – reduce thermal transmittance and help optimize energy throughout the facility. To achieve Payette’s vision, glazing contractor Tower Glass, located in Woburn, Mass., partnered with Ontario-based Erie Architectural Products to coordinate and complete the fabrication of the building’s advanced façade, integrating products to optimize performance while controlling installed costs. Supporting the curtain wall from the roof allowed wind-load supports to be minimized, enhancing views to the pond from the atrium. The flyby bays and adjoining wall that used 1600 Wall System 1 curtain wall utilized a combination of cantilevered horizontal steel supports and dead load anchors at the top of the curtain wall with wind load anchors below. The advanced building technology made possible with Kawneer products helped to create a beautiful and sustainable design for MEDITECH’s employees as well as set an example of sustainable design for the entire community.